How to be a Better Teacher? 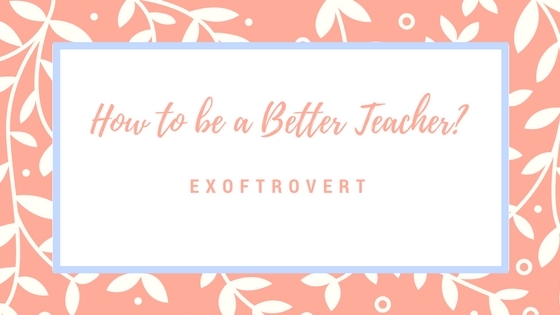 - Ex of Introvert How to be a Better Teacher? How to be a Better Teacher? - Until the age of twenty-one I've realized that there is nothing in this world that is called as luck. Opportunity is a different matter. Opportunity does not come randomly but came from a particular activity or process that we are familiar with hard work. Sometimes, I find my students grins because they feel lucky to get good grades in their exams. While I know very well that in fact, without feeling lucky it was, he was able. He is a smart, open minded, and resilient in doing anything. The only thing that he needed was the belief that he could do so without a fortune. If you are a teacher or a trainer, and then never come across a similar incident like what I encountered at school, here are some tips, quoted from lifehack, to change the way they think, that they do not need a fortune to get good things in their lives. 1. Doing things outside the routine. Improvisation is a very fun thing to do in the classroom. This will bring fresh air to the student or for you as a teacher. Preferably, before making major changes in your class, make small changes in yourself. The smallest change will give a different effect on the way you teach in the classroom. For example, choosing a different route daam your way to school. This will help refresh your memory about the way you through each day. It is not impossible, in these new ones, you will find a good thing to you for your class. 2. Being brave.Do you ever think about anything but you never do? Do you ever want to do anything but stop it at that? Please understand that whatever you do will be a challenge for you. Begin to what you already think in a few days or weeks or months. Writing a book, studying martial arts, write blogs, or even create your own garden reading. Do it! And you'll get more things to do. And you will find comfort and satisfaction in the future that you are undertaking anything to be better in your life. Most of a teacher, trainer, teacher, or whatever it's called is the one who knew all about what they teach to their students. How many of you who teach a specific topic over the years? Does your class grow and change? Is your point of view on your class that developed it remain the same? We certainly need to rethink about what methods we can use to teach a specific topic for many years. Of course, because each class has a different. That the same class may have different ways of thinking of how they think a year ago. Detiap that in class, made up of several different individuals with a brain composed of dozens of different ways of working. Home » Opinion » Social » » How to be a Better Teacher?